To see a contemporary art residency explore all sorts of politically charged issues and yet flourish in a remote village of Haryana is as likely as the disappearance of khap panchayats—notorious for their caste and gender bias—from the state. Yet that is precisely what has happened in Badisher, a small village in the Morni Hills block about 50km from Chandigarh, which has hosted more than 100 artists from across India and the globe over the past three years. 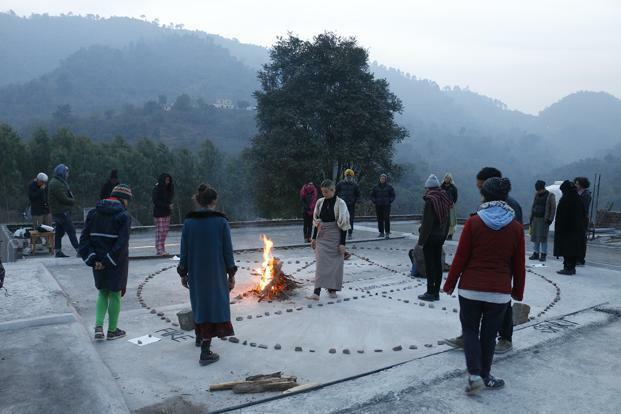 This has become possible because of a unique collaborative approach adopted by the artists at Healing Hill Art Space, a residency for practitioners of art across genres and mediums—dancers, musicians, poets and visual artists. It was created in 2015 by Mohali-based performance artist Harpreet Singh, who taught art in Africa and New Zealand for over two decades, after doing his masters in art from Banaras Hindu University. When he returned to India, the art market’s high tide, which had lasted till the middle of the 2000s, was ebbing. Indian art’s success story didn’t last long because the country hadn’t worked on the grassroots infrastructure for art, he felt. The biggest handicap for the majority of young graduates who come out of the regional art colleges fail is lack of exposure, which keeps them out of sync with contemporary art practices. On top of this, most visual art colleges work in isolation. An absence of interaction with practitioners of other art forms, like music, dance, cinema and literature, further limits their potential, says Singh. Art residencies could fill this gap by offering affordable space to young artists to collaborate, he adds. For the large number of graduates in India every year, though, the number of residencies is negligible. Most residencies in India are out of reach for the struggling artist. Many cost as much as Rs2,000-3,000 per day. And a few, like Khoj International Artists’ Association in Delhi, select only the very brightest. Andretta, another residency in Himachal Pradesh, is mostly restricted to students of Punjabi University, Patiala. Healing Hill Art Space provides basic facilities for artists who pay less than Rs1,000 for a week’s stay, which includes a shared room, meals and an opportunity to evolve by working with artists—in diverse disciplines—from across the country and the world. The residency, fully funded by Singh, began with just four rooms in 2015. It now houses 30 artists in its present building, and has recently added a state-of-the-art dance studio. Singh used his earnings from work abroad and from selling ancestral land to build this. For the first art biennale in 2016, the artists who came to residency were sponsored by, among others, the Canadian Art Council, the Asia New Zealand Foundation and the Swedish Art Council.